Bangkok, Thailand – The 12th annual International Feed Regulators Meeting (IFRM) organized by the International Feed Industry Federation (IFIF) in cooperation with the Food and Agriculture Organization of the United Nations (FAO) brought together feed industry representatives and government officials from around the world to discuss critical issues facing the feed sector with IFIF and the FAO. “I am delighted we had a record number of participants from across the world and from key regulatory bodies join us at the 12th IFRM in Bangkok, including many from Asia. This meeting, yet again, proved to be an important opportunity for the global feed industry and feed regulators to discuss key issues for the feed and food chain, including Codex Alimentarius work relevant to feed and programmes for capacity development for feed safety” said Alexandra de Athayde, IFIF Executive Director. Other topics discussed at the 12th IFRM included AMR, feed safety risk assessment and carry-over of residues of veterinary drugs from feed to food, as well as a session on the work of the International Cooperation for Convergence of Technical Requirements for the Assessment of Feed Ingredients (ICCF), which aims towards convergence of technical requirements specific to feed additive/ingredient authorization across regions. The International Feed Regulators Meeting (IFRM) organized by the International Feed Industry Federation (IFIF) in cooperation with the Food and Agriculture Organization of the United Nations (FAO) provides an opportunity for regulators and feed industry professionals from across the globe to exchange their thoughts and discuss concrete ideas for providing safe feed and food in a sustainable manner around the world. Participation at the IFRM is by invitation only and should you be interested in joining the 13th IFRM in Atlanta, USA on 27-28 January 2020 please contact info@ifif.org. For more information about the IFRM please click here. 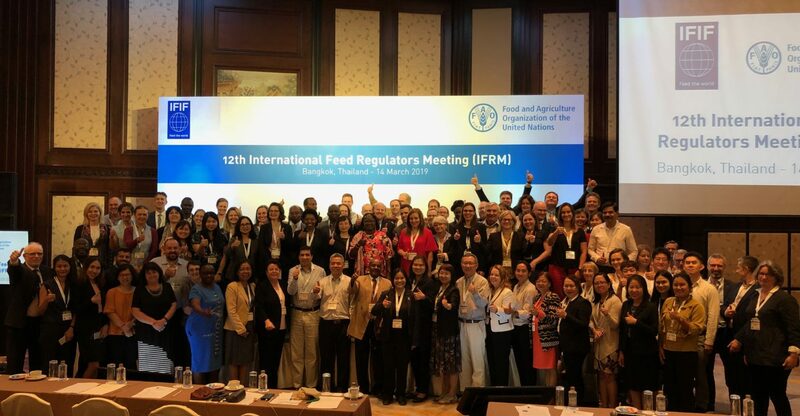 The International Feed Industry Federation (IFIF) is made up of national and regional feed associations, feed related organizations, and corporate members from around the globe, representing over 80% of the feed production worldwide. IFIF provides a unified voice and leadership to represent and promote the global feed industry as an essential participant in the food chain that provides sustainable, safe, nutritious and affordable food for a growing world population. For more information on IFIF please visit www.ifif.org or contact Alexandra de Athayde, Executive Director, at info@ifif.org.